Management of Ramtec Engineering & Trading Company (Niroo Ramshir) with over 30 years productive and excellent reputation in execution of various industrial and reinstruct or projects involved in procurement at mainly electrical equipment and also mechanical, piping, instrumentation equipment and steel structures, co-operating with a variety of international and domestic companies. In addition to material supply, the company is actively involved in the fields of design, engineering and execution of EPC projects in Oil, Gas and Petrochemical industries. Material supply particularly in electrical industry including HV, MV, Control, Instrumentation Cables, HV & Lightening equipment, Power Transformers and SVC, Mechanical Stationary & Rotary equipment, Valves, Pipes & Fittings and also fabrication and erection of heavy and light steel structures (Industrial & Commercial). Should you need any further information please refer to the derision of Works Done. RAMTEC as a main supplier of various equipment is dealing and cooperating with petrochemical, oil & gas industries, power plants and other kinds of industries in a variety of projects. Please find below the names of some companies acting as the end users, consultants and contractors. It needs to be mentioned that the company, so far has supplied more than 150 power transformers; In range of 30 up to 400 Kvs, reached the top level of the existing transformers in Iran Network (315 MVA). Supply of tens of kilometers of various cables (6, 11, 20 & 33KV), Lighting, Control & Instrumentation Cables Co-Operation in many high voltage substation and erathing. Should you need any further information please refer to the division Works done. 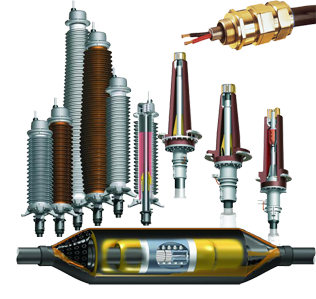 For HV surge arresters & disconnecting switches with ELPRO/GE & ELPRO/ALPHA the high qualified manufacturers. Founded in 1962 with techno-financial collaboration from General Electric, USA ,Elpro International Limited has grown into a diversified business entity with four decades of experience in the design , manufacture , supply and service of high voltage air break isolators, gapless surge arresters,zink oxide blocks,metal oxide varistors and cast and sintered Alnico magnets. The expertise acquired through the resolve and commitment of its people has enabled Elpro to become an undisputed domestic leader in all the product segments that it exists in. Confidence inspired by the inherent strengths of its people has always encouraged Elpro to take the market challenges head on. It was this confidence that propelled Elpro on a growth trajectory when it undertook the responsibility of leading the Indian market for surge arresters and isolators as the collaboration with GE ended in 1996. RAMTEC is representing the quality of MV powers and control cables for utilities and oil , gas and petrochemical plants and LSFH cables for safety from BICC-DUCAB. Dubai cable company (Private) Limited - Ducab - is a joint venture between the Government of Dubai , the Government of Abu Dhabi through General Industry Corporation and BICC. Ducab is located on a site of 54 hectares in Jebel Ali , Dubai in the United Arab Emirates. A major factory expansion took place in 1991 with production capacity being more than doubled. In 1999 , Ducab again increased production capacity for low voltage cables and commissioned a world class production and testing facilities for Ducab powerplusâ„¢ Medium voltage cables. The current factory floor area is 16,000 m2. BICC is one of the world's leading cable makers and provides the day to day management at Ducab as well as providing technology and technical support. Ducab manufactures electric cables to the highest quality standards. This catalogue provides working information on Ducab's complete range of Lead sheathed power cables rated up to 3.3k V and Lead sheathed control and Auxiliary cables rated 600/1000 V. Separate catalogues are available for Ducab's range of power cables, control and Auxiliary cables , writing cables , Ducab smoke master â„¢ cables and Ducab power plusâ„¢ Medium Voltage Cables. power transformers & shunt reactors with ABB transformers group. In almost every place where people live and work you will find at least one transformer. But as long as it keeps working and supplying power to the escalator in the department store , the hotel lift , the office computer , the oven in the local bakery , the farm machinery or the petrochemical plant nobody gives it a second thought. However , transformers are one of the most important units in every production process. Without them the core activities of nearly every business and factory would come to a standstill with serious financial consequences. After nearly 100 years in the development and manufacture of transformers we are well aware of this dependence. This is why , we never compromise on the performance , security or reliability of our products. Nor on design , materials, manufacturing methods , environmental protection or recycling. Our objective is to support you and to add value to your activities , by offering a comprehensive range of top quality transformers. we also provide top class service and support. with this approach we can tailor the most appropriate technical solution to every problem. A high quality solution with better service and support , better for the environment and yet with greater availability and a lower total cost of ownership than our competitors. All over the world , in underground railways , in amusement parks and in every kind of factory you will find ABB transformers at work . In the following pages ABB invites you to find the optional solution to your application and to see with your own eyes that even our standard solution are special. Explosions proof lighting fittings, control stations & junction boxes with well known European manufacturers. Like Walsall , Ceag companies. Here is a review of Walsall co. That is commithed to best quality and being ATEX approved. Walsall Ltd is a manufacturer of electrical equipment for use in wet , dusty and hazardous environments. The company was set up in january 2000 to take over the assets of the hazardous area division of Walsall Conduits Ltd , one of the oldest and most respected names in explosion protection. The objective of the new company is to return the Walsall Hazardous Area brand to the eminent position it once held in the global market for hazardous area electrical equipment. The company is privately owned and occupies its own purpose built factory based in west Bromwich in the west Midlands. The core of the business is the Walsall Conduits hazardous division.To this we have added , by acquisition , the EEx d switch and control systems products of all seasons Martin Limited and the calstar range EEx d fluorescent luminaries from Davies Derby Ltd. We have also entered into a strategic alliance with AG schuch the German manufacturer of EEx e and EEx de lighting fittings. These acquisitions and alliances together with an aggressive orogramme of product development means that Walsall has a comprehensive range of approved products covering all electrical engineering applications. In the last year of operation we invested over Â£800,000 in new manufacturing equipment and tooling. We have state of the art plastic moulding , laser cutting , sheet metal fabrication , CNC machining and label manufacturing equipment and we are proud that we manufacture in-house most of the products we sell.This in-house capability gives us close control over quality and manufacturing lead times , and we are able to respond quickly to customer needs. Will continue to enhance our manufacturing capabilities and invest in high technology plant and machinery . we have an ambitious programmed of product development and all our products have been or are in the process of being ATEX approved. We have recently introduced our website www.walsall-ltd.com which allows easy downloading of individual product data sheets plus an online enquiry service to allow users to build up and send an enquiry at the touch of a button.it will shortly become interactive and allow on-line design and specifications of many of our products. As a total design & engineering provider the company offers an extensive range of HV,MV&LV as well control , protection & instrumentation equipment. The product range covers turn-key HV substation (GIS & Conventional) power industries and power plants. The company is also qualified for execution of EPC , Oil , gas & petrochemical projects. Ramtec Engineering Management section consists of most experienced specialists and Engineering. As a total and replica watches turn key solutions provider the company offers an extensive range of HV, MV&LV as well control , protection & instrumentation equipment. The product range covers turn-key HV Substations (GIS & Conventional) power Industries and power plants. The company is also qualified for execution of EPC , Oil , gas & petrochemical projects. The Ramtec engineering group has got considerable experience for the most sensitive and important power projects in Iran the replica watches uk commercial management has obtained enough expertise in import & export of various equipment and maintained close relations with the international markets and manufacturers in all over the world. The company has also developed division in engineering being involved in design, material supply, fabrication and rolex replica delivery of mechanical & piping equipment and steel structures as well as electrical equipment. Address: 3rd floor, No. 408, West Mirdamad Ave.